Given Superman's vulnerability to magic, I am surprised that he wasn't paired up with DC's mystical characters more often. He didn't have much interaction with Doctor Fate or The Spectre, despite their Justice Society of America connection. Zatara was also introduced in Action Comics #1, and yet I don't recall if they ever shared an adventure together... which would have been cool to see. Basically, you're right... although there was one fairly early story in which Batman & Robin -- driving in pursuit of the Joker -- briefly encountered the Star-Spangled Kid & Stripesy in pursuit of one of their villains. Oh, and over at Quality there was a two-part crossover between Phantom Lady and the Spider-Widow (who happened to share the same writer...). Interesting! I've never heard of the Cycloids before (except for the robotic ones on SPACE GHOST: TOS). Makes me wonder if they learned their sufficiently advanced wizardry from Yandroth? Well, I just made up the name Cycloids - it seemed like it fit! Nice one Ross! How about The AVENGER (The gray skinned vigilante of Justice Inc. fame) meets The AVENGERS. Maybe there is some sort of bounty on one or more of the members. While I agree with Jay Johnson and his excellent explanation, as a DC guy I would like to point out that Superman and Batman were regularly teaming up together in World's Finest Comics years before Marvel comics were even called Marvel comics. However, AirDave is right that it was Stan Lee at Marvel that first realized the potential of a fully realized shared universe. And I'm glad that he did. On a whole other note, these aliens remind me of the aliens that invaded Earth in the mini comic that they gave away with the old Captain Action action figures. Does anyone else remember that comic? @Snapper Carr: Ross was probably afraid everyone would confuse him with Luthor. "Ah, you seen one bald baddie, you've seen them all!" @Anonymous: baldness does not automatically make one a super-villain. In fact, here are some little known slogans once used by the Hairless Clubs of America. 1970's: "Baldness! The love-child of Mother Nature and Father Time." 1980's: "Just say 'no' to rugs!" Present-day: "Once hair you lack, you never grow back." 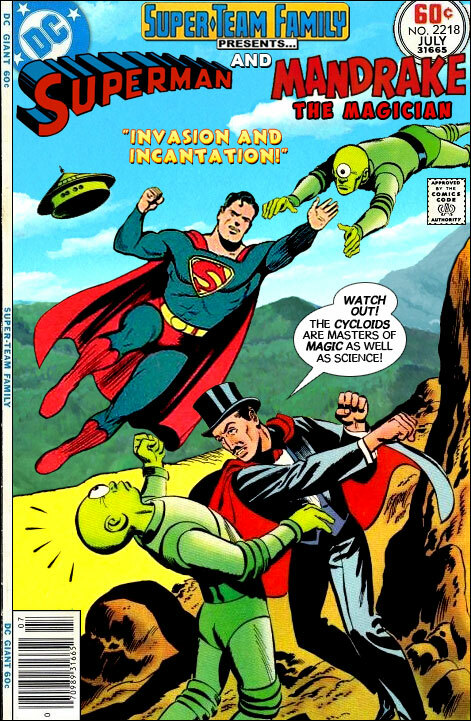 Given Superman's vulnerability to magic, I am surprised that he wasn't paired up with DC's mystical characters more often. That was exactly my thought when I saw the title for this one! Not only a clever pairing on that score, but excellent choice of classic styles to blend. Interestingly, this is a cover that would have worked great with Zatara in Mandrake's place -- and I think that those two magicians would be great on a cover together. But you're right; I think a team-up between Superman and Doctor Fate would have been (and probably still would be) epic. Re: baldness... It took until Patrick Stewart appeared on Star Trek: The Next Generation before people started to recognize that bald men are sexier and more verile. I think they've forgotten it now, though. @Wolfhammer: Or how about the Avenger meets the Avengers and the Avengers (John Steed and Emma Peel)? Maybe the Crimson Avenger and Birdman's pet falcon could join the party. *A Kryptonian arachnid once simulated by Velvet "The Evil Insect Queen" O'Mara. P.S. @ BG: Superman and Dr. Fate already teamed up, in "Peril of the Planet-Smashers" (WF v.1/#208). Cary: Thanks for the tip. I'll look for that, and hopefully it's not too "early Silver Age" in its outlandishness. I probably should have said "frequent team-ups." Related subject - I wish more could be done with Doctor Fate in live action in any event. Brent Stait's portrayal on a single episode of Smallville showed that many of the elements of the character that caused concern for the producers at the time actually worked in the character's favor (and it helped a lot that Brent was masterful at marking the difference between Kent Nelson and Nabu). Other Bob: I've already suggested a team made up of Captain Avenger, the Crimson Avenger, the Toxic Avenger, et al. I don't know if anything will ever come of it, though. Ross, I remember a story in the 1980s when Zatara shared an adventure with Superman when he was still Superbaby, and ended up predicting a big future for the small child. But I don't remember seeing any follow-up. Ah, the Earth-2 Superman! Or, simply, Superman. =) Always love seeing him in any rendition, but what of the reasons I loved the All-Star Squadron so much was seeing him in action in his prime, rendered by modern artists. Cheers Ross. Remembering too the long running search for Zatara starring Zatanna and the JLA. Ross, what chances of the Warlock of Ys vs. The Wizards of Oz and Id? To TJW's point, during the early Silver Age Batman (and Robin to a lesser extent) were more or less members of the "Superman Family". They could and would pop up in any of the Family books, including Jimmy Olsen, Lois Lane, et. al. Superman got top billing in World's Finest and IIRC most of those stories felt like Superman stories rather than Batman stories. At this point Batman was down to just his own book, half of Detective, plus World's Finest and occasional appearances in Justice League. Of course, then came the 'New Look' and a TV show and Bats was back on top and the Superman Family books became old-fashioned and got cancelled. Green Arrow and The Beast in "Get a Grip!"